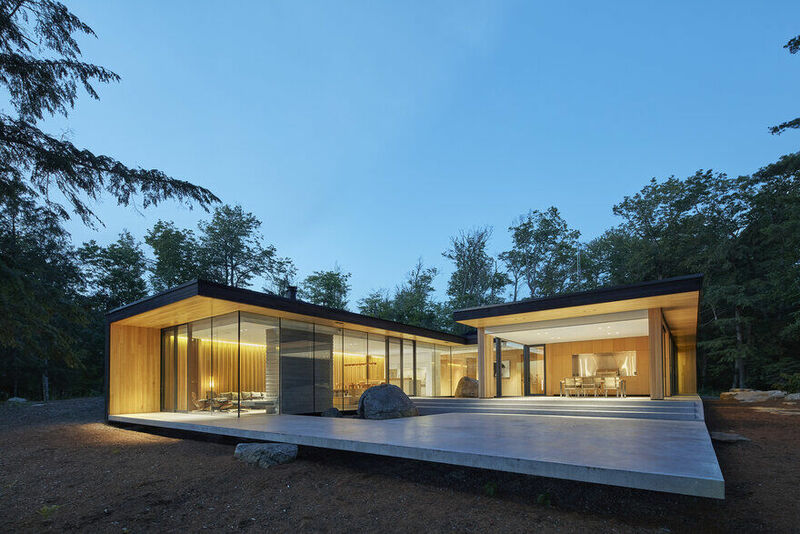 A Toronto family required a new four-season residence to replace their existing 1930s structure on a west-facing peninsula with the goal of maximizing outdoor living and entertaining. 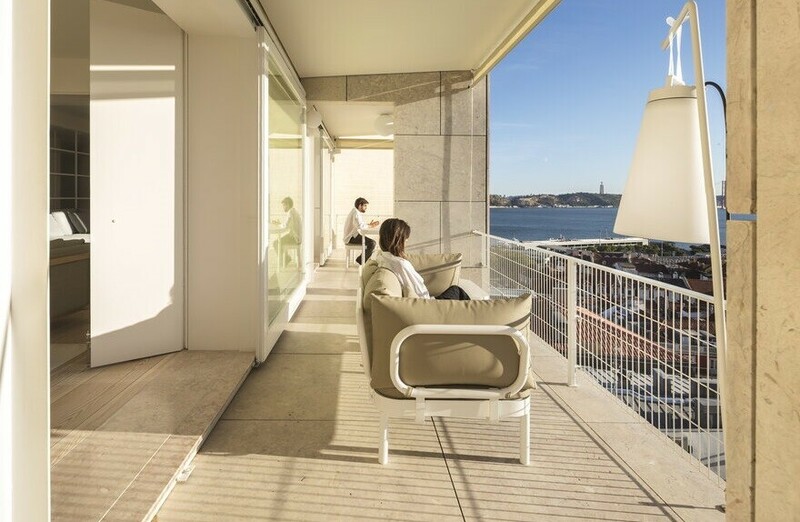 An interlocking plan allows for indoor spaces to support a central outdoor living space as a weather protected microclimate extending seasonal use. The definitively modern structure is designed to cascade and hover over the grade, to blend with the landscape, and to have a quiet presence from the water. 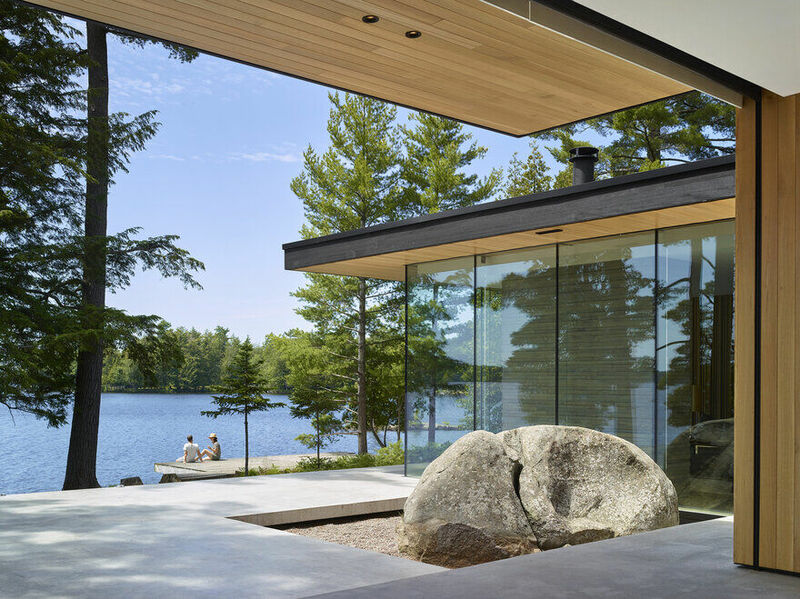 The Lake Manitouwabing house by MJMA was developed around the goal of enhanced outdoor living and social gathering. A rectangular plan is carved to create interlocking outdoor terrace and courtyard spaces featuring an expansive and levitating lake deck and screened porch. 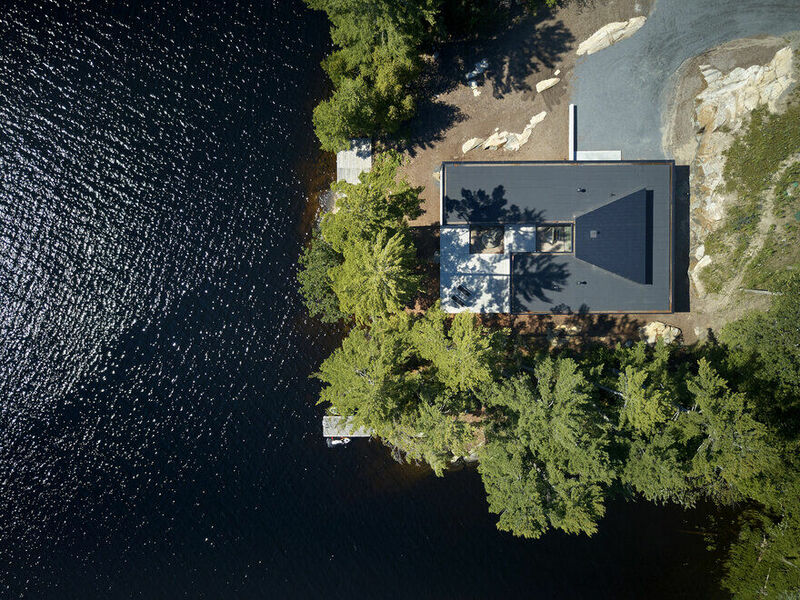 Extensive flat roofs recall warmer latitude mid-century precedents and float outward to frame the quintessential Canadian shield horizon. The greater plan has a clear singularity with its opaque outer shell retaining the intimacy and humility of cottage vernacular. 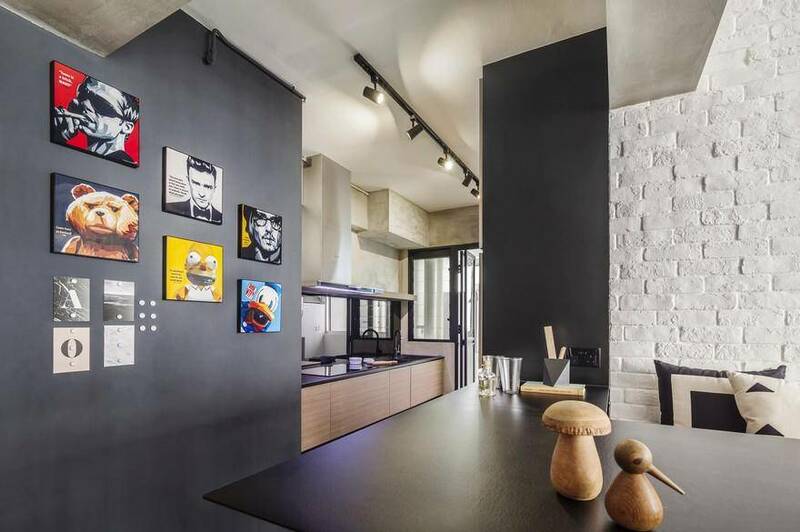 At the heart of the design is a central courtyard, featuring a uniquely clefted rock, curated to speak to the power of its place as well as its affinity to the project’s design parti. A large screened porch has three sides of retractable insect screen – wide open or bug-free – dependent on season. 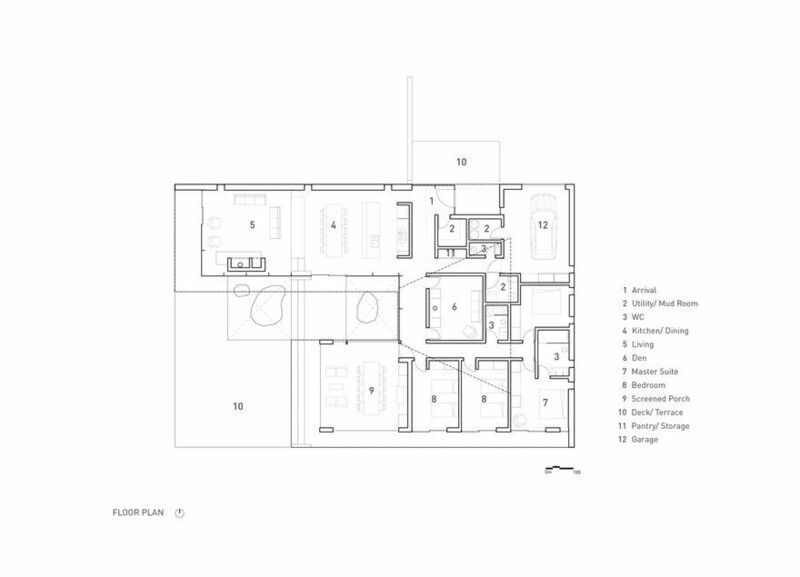 The plan is divided into three east-west program bars with public living placed on the south west, private living on the north east, framing the outdoor living space in between. 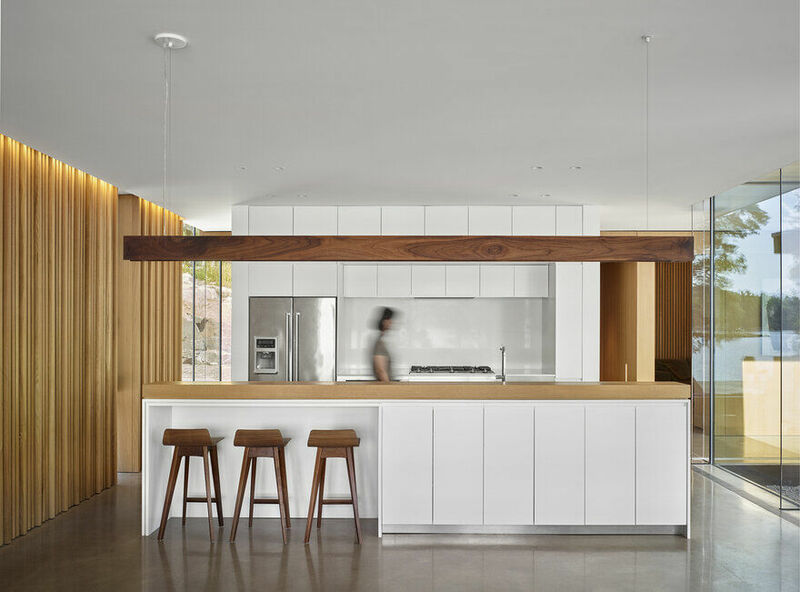 A ‘sharkfin’ clerestory roof captures morning light to internal rooms. 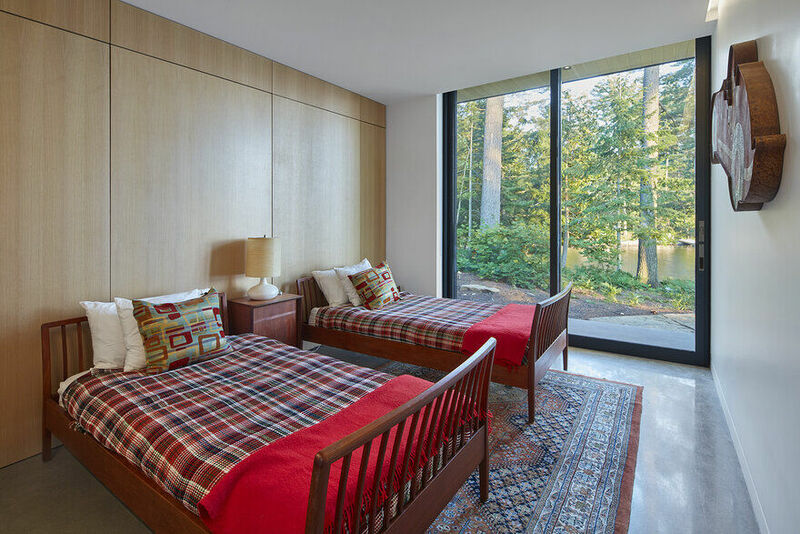 The site’s orientation is south and west, collecting warmth, light and views throughout the day. The building sits low on the land and steps along its length to connect with the landscape. 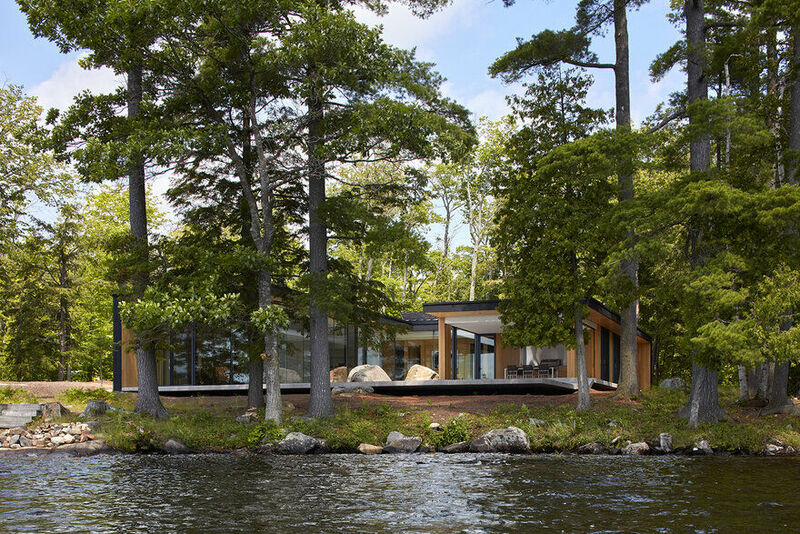 The Lake Manitouwabing house sits quietly back from the water behind a stand of archetypal pines. 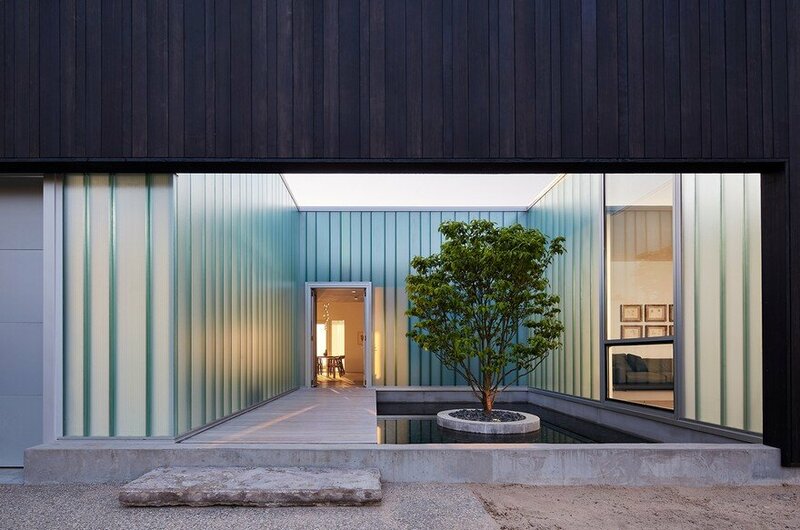 The flat roof bungalow shelters both indoor and outdoor living spaces and presents two dominant relationships based on orientation – transparent and open to the south west, opaque and protected to the north east. 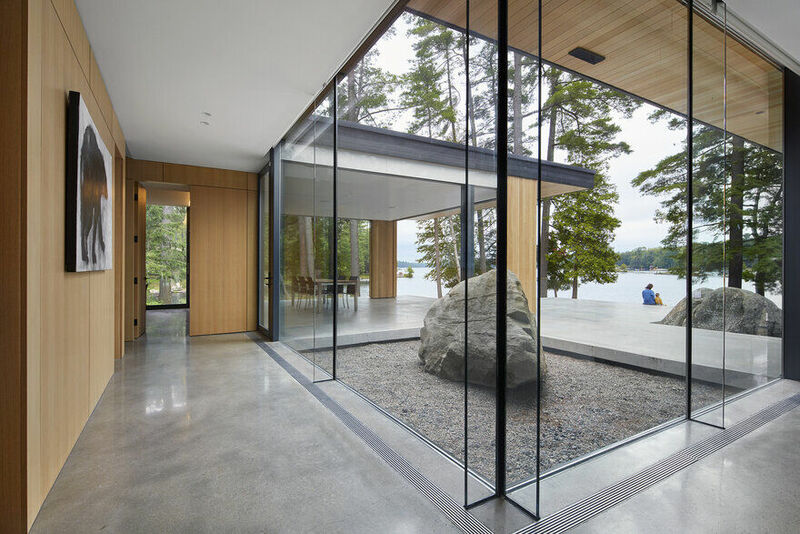 The main living and eating areas backstop the length of the outdoor space and is oriented directly to a view of the spring and fall equinox sunsets which disappear precisely into an open channel between two islands at the far side of the lake. 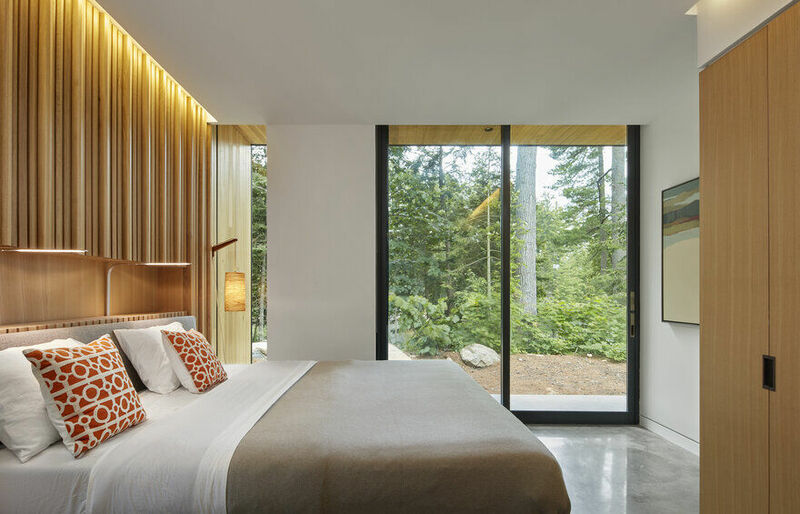 A bar of bedrooms is located along the private portion of the site opening out to a southern lagoon, affording east morning light and oblique lake views. 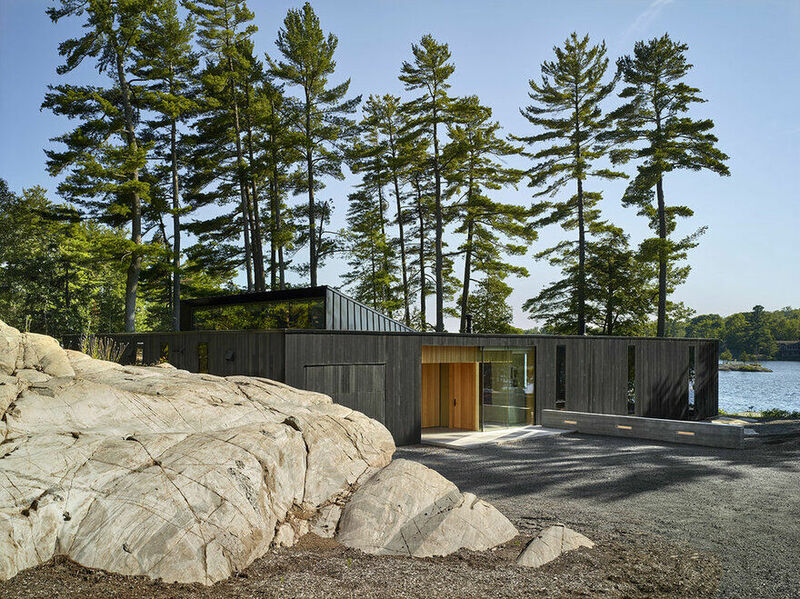 The Lake Manitouwabing house is designed to take advantage of passive heating and cooling orientations and to create a shelter outdoor microclimate. 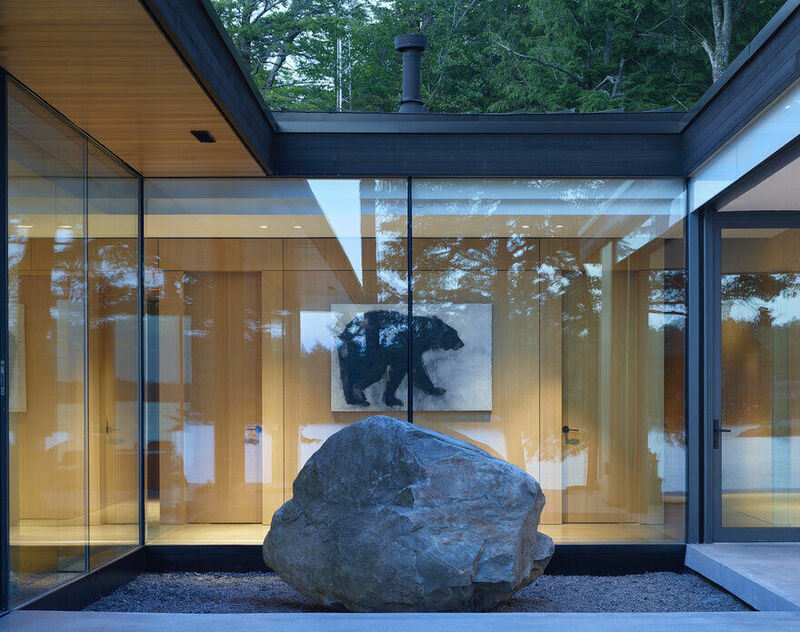 Deep overhangs and large glazed areas on the south and west were modeled to protect from solar build up in summer and allow for heating gains in winter. North and East faces are heavily opaque, minimally articulated, and highly insulated to protect from winds and heat loss. 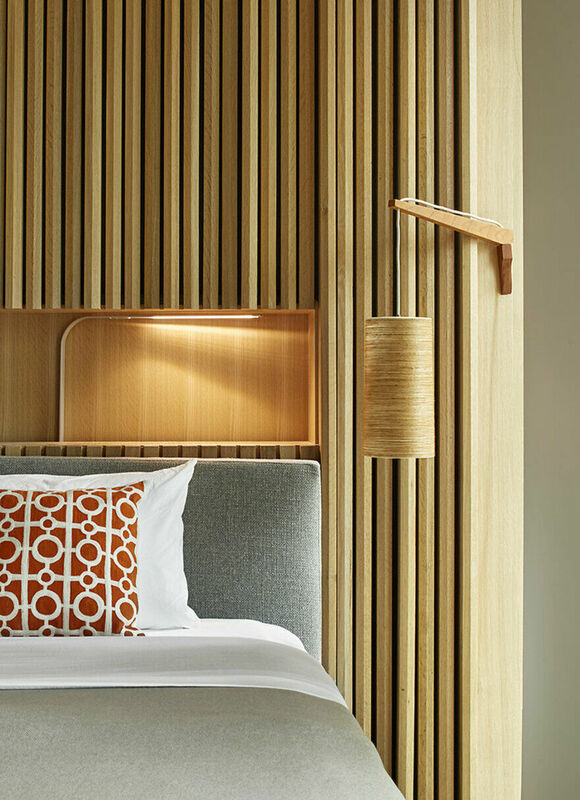 Operable windows on all sides are designed for cross ventilation and passive cooling. 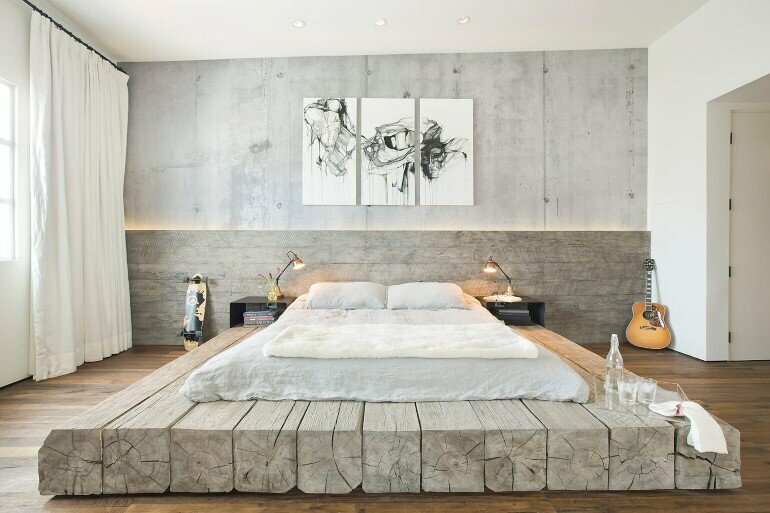 Concrete radiant floor heating contributes to energy conservation and creates a heat sinks through the day and night. 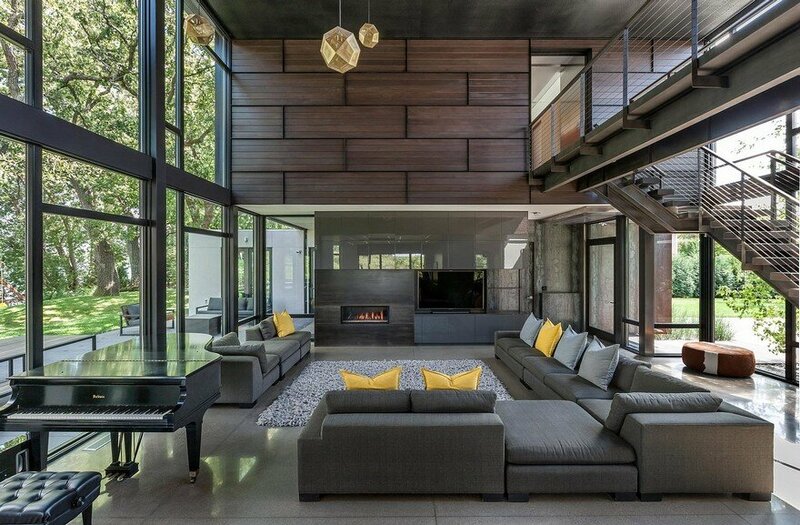 A high efficiency boiler, HRV, and convection wood stove reduce overall energy consumption. A taught envelope design, R-35 roof, and low-E glazing maximize performance. 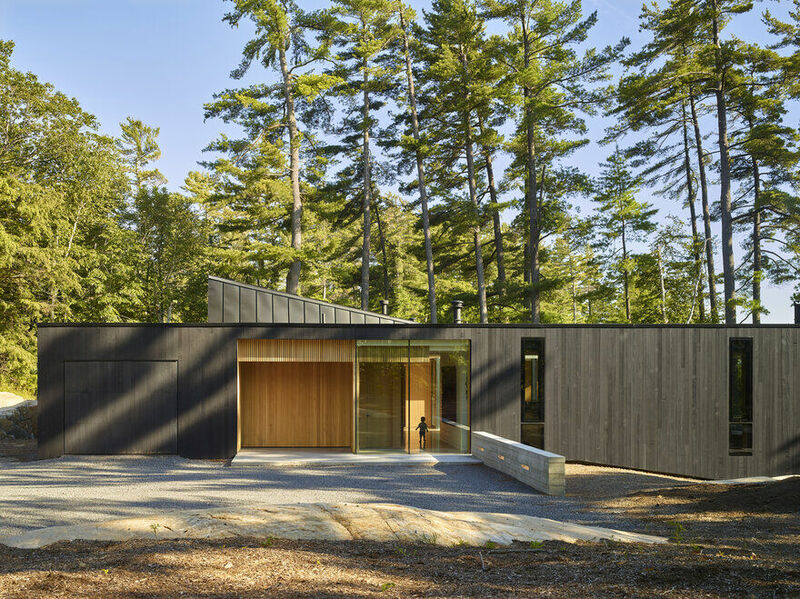 The building reuses the clearing of the existing structure and careful tree protection minimizes tree loss. The clients wished to remain connected with the land and to dwell outdoors as much as possible to help achieve greater health and wellness. 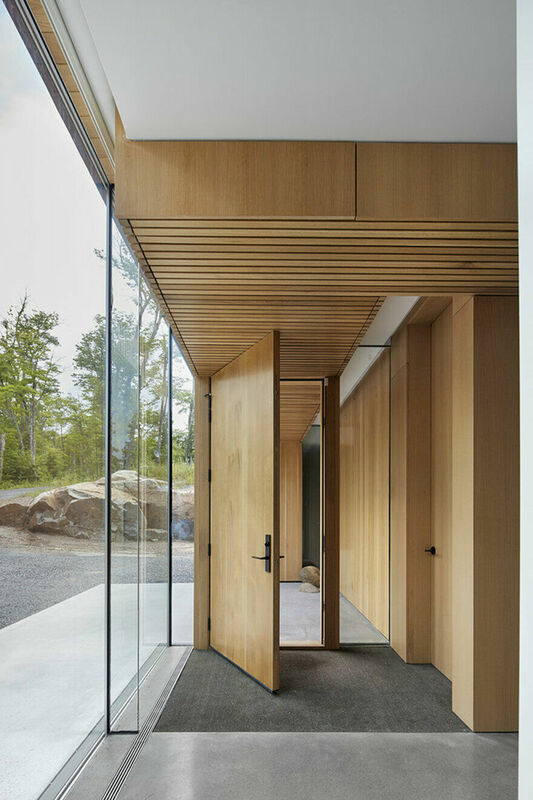 The design focused on these goals – a low and stepping siting, large percentage of operable windows, maximized wood finishes and cladding, simple bold exterior, sheltered space within the building roofs, and solar modeling. 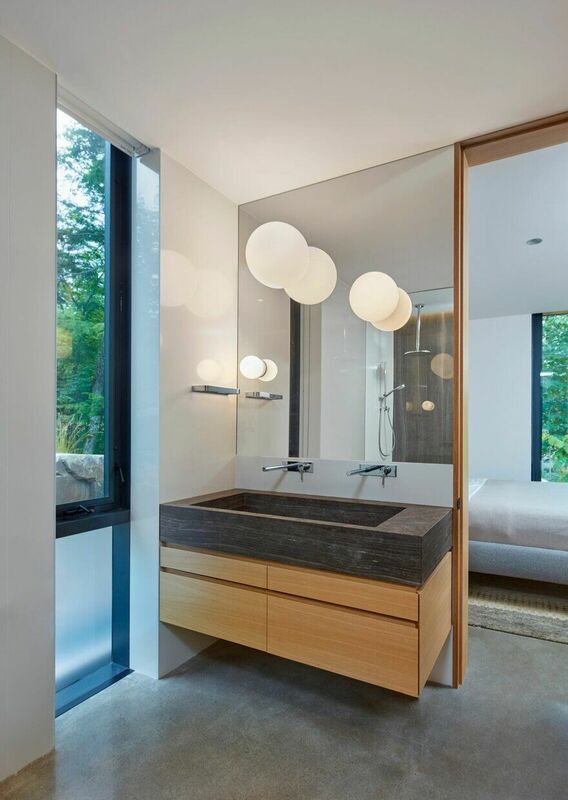 All elements conspire to create fluid indoor/outdoor spaces and greater connection with nature. The project strives to embraces outdoor living and extend it through the seasons. In doing this it generates a formal response driven by the site and a clear client driven goal creating highly social and healthy outdoor space. 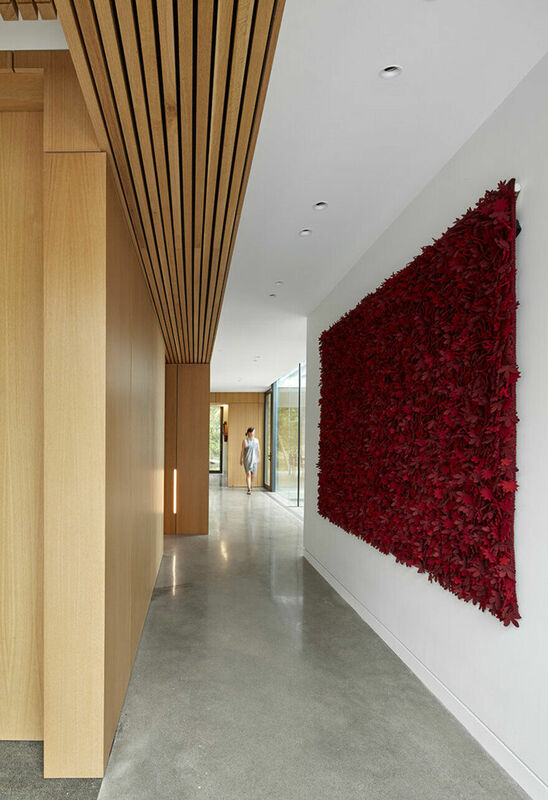 In doing this it develops and reconciles the building’s formal language with the requirements of the site and orientation. 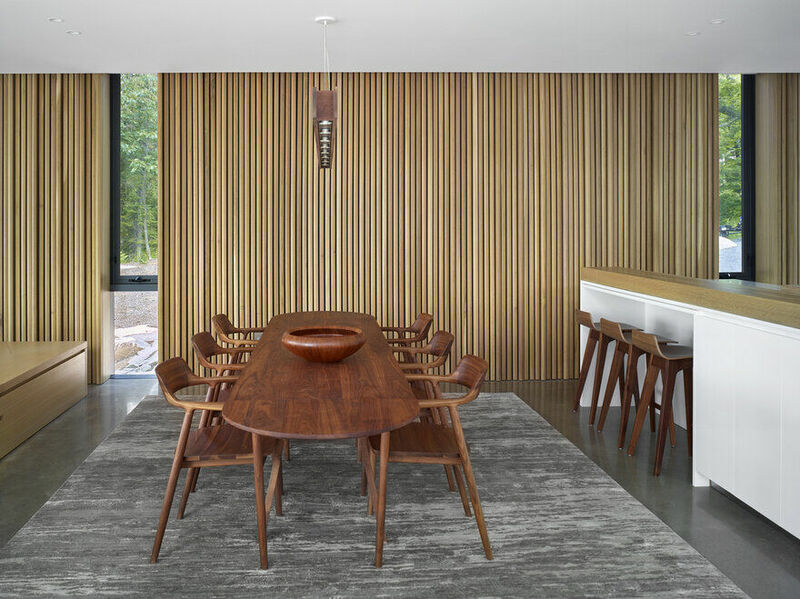 It provides clean lines, abundant light, and connection with nature while achieving a humble and contextual form that harmonizes with its context.